This was a really helpful talk in illuminating why it doesn’t work to simply drop a mundane math task into some sort of “relevant” or “real-world” context. And it was great that you didn’t stop at deconstructing these unhelpful approaches, but instead went on to share specific ways to think, steps to take, and tools to use to increase engagement and thoughtfulness in our math classrooms. A very natural follow-up to the famous “Math class needs a makeover” talk. Great work, Dan! Thanks!! Nailed it. It was great to this “fuller” version of the content here. It really helped fill in the cracks of some of the things I’ve seen before from other talks/presentations. I do think it is little tougher technologically than just a “white rectangle” though. Where can I get the “circle/square area” video? Do you ever make your slideshow available so we can use some of this in the classroom? At least just the video file? Thanks for all you do! I enjoyed the talk a lot. Not telling all at the beginning of an investigation is a sure way of getting them thinking. However, in the case of the square and circle it’s a bit rabbit out of a hat to introduce the scale before someone has asked “How do we know where they are?”. Some prodding may be necessary. There is room for lots more thinking before the graphs are plotted, in fact they could generate these themselves using printouts of the process at different stages. I wonder whether anyone ever asks “What rule is used to fix the sizes at each distance?”. With the animals investigation one could say, once the full picture is supplied, “Now find a question about this, and answer it”. (not for beginner users of this approach!). Now I’m going to spend the next six weeks trying to find a scenario that naturally leads to “completing the square” !!!!! This was definitely one of the highlights of the NCTM Annual for me. I immediately took your ideas and shared them with colleagues of mine during a PD at our district office yesterday…Don’t worry, I made sure to give you all the credit for the ideas I was presenting, including your jokes about the congruent triangles on an orca whale’s tail. You are inspiring more than you know, Mr. Meyer, including myself. I have a massive headache and craving time release aspirin, not the fast acting extra-strength stuff. Please keep the ideas coming! Thanks for posting this and writing more about it. I am working hard to keep engagement high. This week, we actually started with two blank triangles, one right and one obtuse. I asked kids to solve the triangle, and ask me questions. There were no measurements on the triangles. The triangles were to scale. They could ask me for one value. I think this was an example of ‘not real world,’ but their interest was piqued because they had so much room to try to understand the problem and solve it. And, while the solutions were somewhat closed, they could all get slightly different answers based on their original measurements and decisions. Powerful. I’m so inspired by your talks and your work. I really like that you’ve put out there this time: engagement is not reached by writing a polynomial closed question about snowboarding. That’s not interesting for students or teachers. It was such a good experience, I’m writing a blog entry about it! I do think it is little tougher technologically than just a “white rectangle” though. Where can I get the “circle/square area” video? Do you ever make your slideshow available so we can use some of this in the classroom? At least just the video file? Thanks for all you do! The white rectangle is weirdly versatile, though. Check out a few examples sent in via email and Twitter. You aren’t wrong, though. The greater your technological capacity the more flexibility you have in posing a problem. The circle & square involved substantial After Effects work, for instance. You can download those files and if you want anything else from the presentation (short of the entire file) please let me know. However, in the case of the square and circle it’s a bit rabbit out of a hat to introduce the scale before someone has asked “How do we know where they are?”. I don’t know if that’s true. Or at least, I don’t share the premise that the students must have complete control over the posing of the problem. Once we’ve exhausted the problem’s interest without the number line, that’s a great time for me to introduce the number line. @Daniel, thanks for passing along your example. I’d love to know what questions you asked on each slide. I think this was an example of ‘not real world,’ but their interest was piqued because they had so much room to try to understand the problem and solve it. Nice, yeah. I’m convicted that the world doesn’t matter so much (“fake” or “real”) so much as the work students do within that world. Good evening. 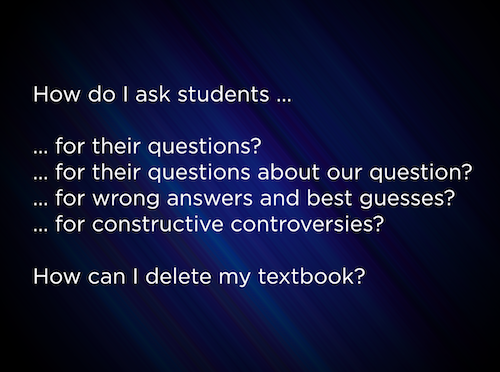 Thank you for the ideas presented in “Delete the Textbook “. Our elementary school district would like our teachers to receive this information and enhance our lessons in an effort to reach and teach all students. As the speaker at the NCTM conference on this topic, will you please give me the Top 3 pieces of advice you have for the teachers of our youngest learners? We are K-6 and want to start now. Thanks for the question, Andrea. It was provocative enough that I built a new post around it. What is the first question that comes to your mind? What do you think is in each bag? Which bag do you think is heaviest? Do you think all the marbles are the same color, contain different colors, or a combination of colors? Which bag do you think you are most likely to pick one blue marble on the first try? Why? (extension) How many blue marbles would you need add to the other two bags such that the probabilities are the same? @Daniel, I guess the trouble I’m having with the first set of questions is that all the bags are the same image. So it’s difficult to even intuit which bag is the heaviest. I guess this is where I turn to some actual media – eg. photos of real bags. Not because they’re real, which I don’t care loads about, but because the media facilitates estimation, which I care a lot about. Great point. Looks like I need to buy marbles next time I’m at Target. Thanks for helping me get better! Thank goodness. I was beginning to get sick of hearing, “We have to make math real world”. You are redirecting our focus to the “math volume” in our classrooms via controversy and question developing. I appreciate you modeling how to “makeover/transform” the textbook problem. I am going to try question developing on “Completing the Square” using Algebra Tiles on Tuesday. A solid presentation, as always Dan. Live deleting the textbook problems was a brilliant way to show the world that anybody can go through the process in a short time. I’ve found the same high value /effort ratio in doing this for students. I wouldn’t be surprised if this became the opening activity for math department meetings this week. Fantastic presentation and has really helped me with one issue which I have been mulling ahead of my maths (I am in the UK) teaching course. How do you combine engaging open-ended tasks with the need for students to develop the necessary confidence with tasks on which they are going to be examined in formal examinations. I was really encouraged by the problem you used on surface area. I loved your way into the problem, but I also liked the way that you left all of the examples up on screen for students to do. Am I right in saying we need both? Perhaps, using the techniques you highlight and Prof Boaler discusses, we need fewer “drill” exercises, but am I missing the point if I say students need to do those exercises to get them used to the kinds of problems on which they are going to be examined? @Daniel I was also confused by the first slides as they were all the same. Imagine if you started with the three images including the number of red and blue marbles. Along the lines of Dan’s presentation, it is something you can ask questions about. I love the fact that you are doing this with your colleagues. It seems you are having your own puzzling sessions. Puzzling about the puzzles. I like your dial metaphor and I agree that mathematics should be intuitive, and this often means postponing rigor in the short term. This year I broke from tradition while teaching similar triangles and just had my students create their own definitions for similarity & congruence, based on sets of images I showed. We also spent extra time on angle theorems because there was a lot to observe, debate, justify, and name. These were class discussions and I didn’t formalize anything for them – I let them refine as necessary, and only suggested improvements to their vocabulary where it made sense. Pure math isn’t boring. Sometimes I think students are relieved when they aren’t expected to apply everything to the “real world”, and can just work on the theoretical stuff. Seems to me your definition of the “real world” as (1) the world about which questions can be asked, or (2) the world students (I) can ask questions about offers is a powerful insight into education and learning. A young student relies on a teacher who knows how to pose questions in terms of a student’s world that expand that students world. I am not a teacher, but let me presume a good teacher radiates recursion based on questions and problems, and that is where we pick up bootstrapping for ourselves. I can see student alienation addressed by a stimulating instructor asking good questions. If the goal of math education is the ability to solve problems, then the student must come to know how make the questions. Real problems require an inductive approach: a real problem presents itself. I understand students must first be interested, but eventually they have to solve problems for themselves. I’ve found some of the best ways to start class is with the Which One Doesn’t Belong. Students are dying to share a thought that others may not have. It also has that low entry high ceiling aspect that we are always after. Example, most can pick out that one of the terms has a negative sign, while the rest are positive. When I think about it, all I did was leave the text of the story up and deleted the numbers. I think this year, I’ll delete the paragraph and the numbers… Ask for questions, notice, wondering, etc. Then ask what info they need to solve it (the dimensions), and then let them get after it. One of my issues is getting them to show their work clearly so that when they do present before Act 3, that we can clearly see their thinking and follow it. I’m also trying to figure out how to have my EL and SPED students access these tasks easier. So far, I can only think, in the fish tale, is a cloze sentence where they are suggested to use the pythagorean theorem with questions? This is a cloudy topic where I think we as teachers need more help with. How do we make these engaging situations and grade level topics more accessible for the students with less background knowledge? How do we make these engaging situations and grade level topics more accessible for the students with less background knowledge? It’d be nice also – before they’ve seen either path – for them to speculate the fastest route possible. To draw one. And then to draw a very slow route. All of this is complicated by the 3D nature of the task, but these questions are all “lower dial settings” than the current task, which asks for calculation. As an aside, the starting question – how do we make maths engaging – is somewhat ill-posed in so far as there appear to me multiple different conditions well worth distinguishing. For example, from my experience making things engaging to primary school kids can be quite different to making things engaging for middle school or high school kids. Also (and sometimes related) the specific task of engaging kids in maths seems to depend at least to some extent on previous experience – kids that have had years of positive maths experience can probably stay reasonably engaged even with standard practice. On the other extreme are kids that have had no positive experience with maths for years. There may well be all kinds of other relevant variables here. Also – and while I fully appreciate that you could not possibly adress all common approaches to life student engagement in your presentation and hence focused on three common approaches plus your own – let me just mention that there are a number of other approaches that appear promising (at least for some groups of students) too. I, for example, would like to highlight aesthetic considerations. Maths can be beautiful and many students can come to appreciate its beauty if teachers draw out the beauty in the maths and direct the student’s attention to it. Or gamification. So much of maths can be taught through games and a lot of students love games (and, of course, desmos has some fantastic maths activities/games!). This is great – thank you for posting it. I’m hoping to get into the high school system and have done 3-act math activities with high school classes. Right now though, I’m teaching at the college level, and the class is basically a review of topics that are taught in grades 4-12. One issue is the courses are so jammed packed that there’s really no way to fit in the 3-act math. So, this gives me a lot of ideas that can be done in less time but are still more interesting than the “real world” problems we use in the lectures. Thanks again! Great talk Dan. I have the dubious honor of being the one who sent that ill-informed tweet in an effort to make the meatball problem more relevant to students. I recall having a realization after watching your 3-Act approach to this problem –it was not about the relevance per se; it was (partly) about lowering the level of abstraction to get students to buy in and want to solve the problem. Just because a problem is ensconced in some sort of “real world” scenario does not in itself create that “headache-in-need-of-an-aspirin” scenario that you have talked about in the past. 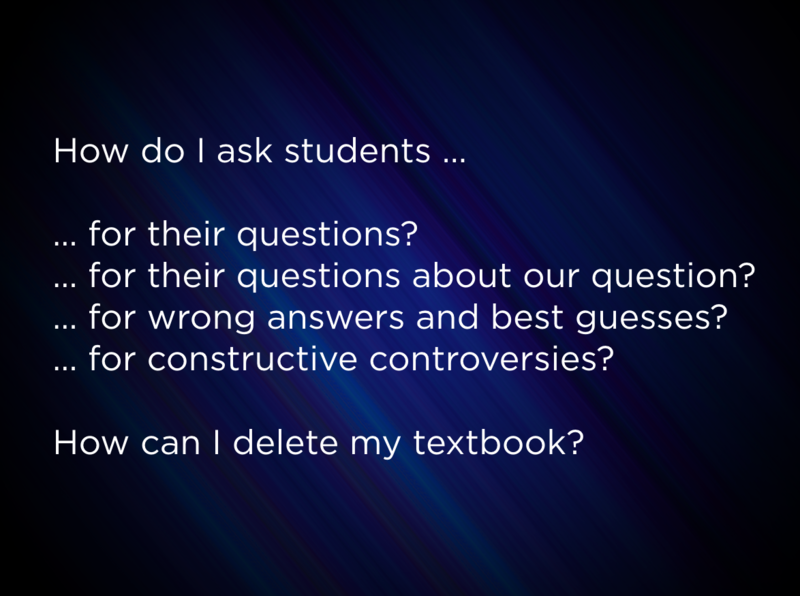 When I have lowered the abstraction ladder, students’ questions are more inquisitive and nearly everyone is engaged. One issue is the courses are so jammed packed that there’s really no way to fit in the 3-act math. So, this gives me a lot of ideas that can be done in less time but are still more interesting than the “real world” problems we use in the lectures. Great. My hope was to extract general instructional design principles from my 3-Act work that could be applied more generally – to pure mathematics! – and with smaller commitments of time. Do let us know how you apply them. When I have lowered the abstraction ladder, students’ questions are more inquisitive and nearly everyone is engaged. Well said. Glad you’re still willing to stop by and chat with us, Scott. My sense from the talk was that you imagine the math dial being turned up within a lesson. Meaning, first we ask for questions, then for estimates, then we dive into the problem. This is in line with a lot of your Three Act work, I think, and I’ve seen it work well. Thinking about my own teaching, I more often find it helpful to turn up the dial over several days. This lets me use these early bits of the math dial as formative assessment, and I have time to think carefully about what they know and what they’ll need before productively struggling with a problem. So, for instance, I might ask kids some lower-dial questions about a prism (noticings? estimations? etc.) a few days before I ask them to solve a prism volume question. We always want to turn up the dial a bit during the lesson, but I think that’s a delicate matter. I’m sure there’s lots to say about how fast a teacher should move from the intuitive-concrete to the formal-abstract. But I’m always overjoyed to find teachers who offer students experiences along that continuum at all, at any pace, rather simply draping the formal-abstract in adjectives (real, relevant, gamified, etc.) and nouns (orca whales, Jose Blanco, etc). Dan wisely said conflict can help make discussion useful. Let me try to start some. Common wisdom seems to say the solution to alienation ( we can use that word, right?) is found in presentation and rearrangement of the usual material. From the outside it looks like common wisdom could be the result of internalizing constraints imposed by the profession and the system. After all the material and the basic approach is the same, and still focused on the education system’s internal needs; standardized tests and preparation for the next academic level. Don’t get me wrong, 21st century entertainment values are likely an improvement all the way around, but they do not get at the heart of the problem. We all need to learn how to use mathematics, almost none of us will ever do it Current school mathematics has virtually none of feel of real problems. This is not a question of their subject matter, it is their academic orientation inward toward number and arithmetic, nothing of real problems seen outside an academic stetting, they reflect no outside input. This is not a question of vocabulary nomenclature, or subject matter. It is an inverted emphasis on numerical calculation. Formulation of the quantitative expression of the problem is the secret to real problem solving; this is not a question of algebra. The current approach to school mathematics prepares students for a consumer role in an advanced society. To be productive participants they need be learning how to approach real problems. Long time listener, first time caller. I’ve been fortunate to work with some great colleagues, where we’ve been able to delete the textbook on many occasions. However, time constraints don’t always allow for that. Therefore, thank you for your blogs, as I use resources like your blog to be my secondary colleague. * How “much” ice is enough? How “much” ice is too much? * How “much” ice would you want in your cup? My hope is to take this volume problem to dive into other topics, such as proportionality. I really enjoyed this presentation and always learn something new or develop more questions and confusion (which is a great thing!). Thank you. I like your style, Sonny. I gave the problem my own 3 Act spin here. Alright, I admit it. I still can’t figure out how you deleted the grid lines on the animal graph. Any pointers? After watching this video back in May, I attempted a version of the “deleting the textbook” with our curriculum in my 3rd grade class. The results were amazing. I recorded the lesson so that I may go back and review student responses, participation and engagement. I can only say how sorry I am that I didn’t start this sooner. The students took their collaboration and thinking to levels that some would have said were unreachable. I am now an instructional coordinator and have demonstrated lessons with this technique in grades 2-5. Success every time! The teachers are amazed with the student engagement and their buy in is solidified once I show them how easy it is to put together. Thank you.